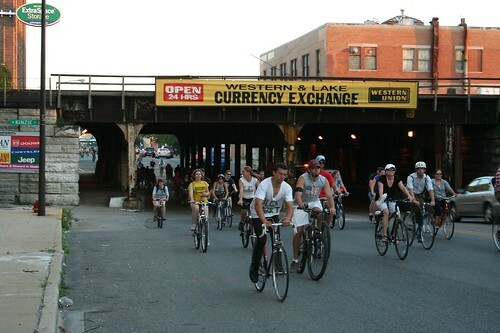 I have a lot of mixed feelings about Critical Mass. This was my second time riding in one, but I’m familiar enough with the dynamic from the LATE Ride and other such events. 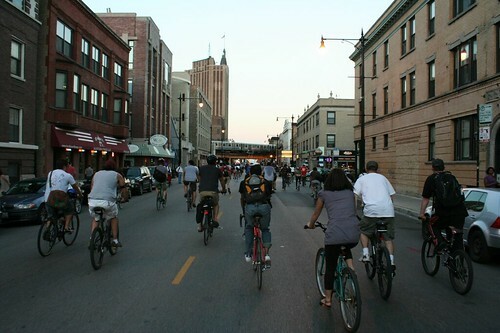 Inevitably, when you get thousands of bikers riding en masse on city streets, some conflicts with drivers occur. I don’t know if that’s good or bad. I can totally sympathize with a bunch of angry, stressed out drivers slogging through traffic, trying to get somewhere, maybe late for a date or a meeting or a train or a flight, and then getting held up through multiple green lights by this mass of bikers going nowhere. On the flip side… well, how many of these drivers really have somewhere so important to be that it can’t wait five minutes? It’s a good thing to get pulled out of your little driver world every once in a while. Driving is not the be-all end-all of tasks in life, and cars do not have exclusive rights to public streets. 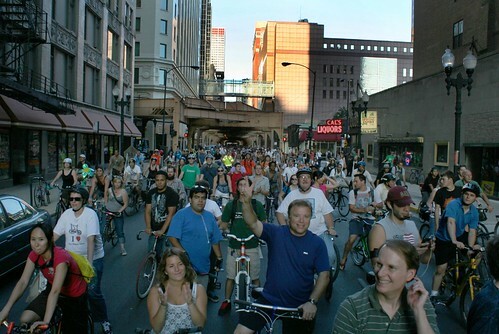 Anyway, Critical Mass is generally a joyous occasion, full of thousands of happy bikers. At some kind of tipping point, don’t sheer numbers give them the right of way? 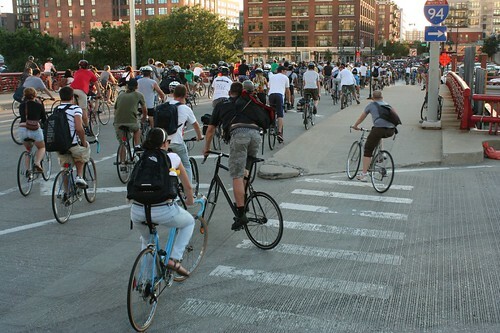 But if there’s one true flaw with Critical Mass, it’s that it just doesn’t ever stop itself to let some traffic pass. At all. 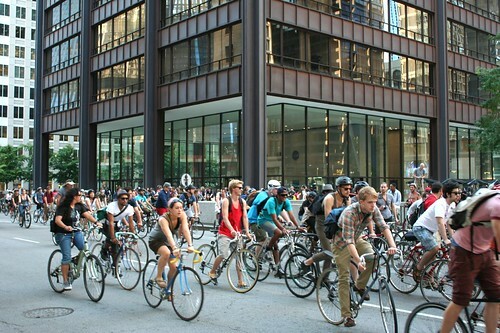 Considering the mass of riders can be strung out for many, many blocks, it’s not very fair to drivers to make them sit through the whole thing. It’s small wonder that a handful get impatient and start nosing their way into intersections, resulting in the inevitable and pointless confrontations. All that said? Riding in this enormous group is a heck of a lot of fun. 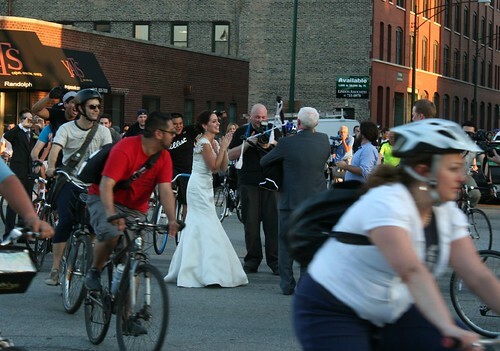 This was the coolest thing on this ride – a newlywed couple getting their photos made, who happily got out into the middle of the street to mingle with the passing bikers. Additional photos at my Flickr space. 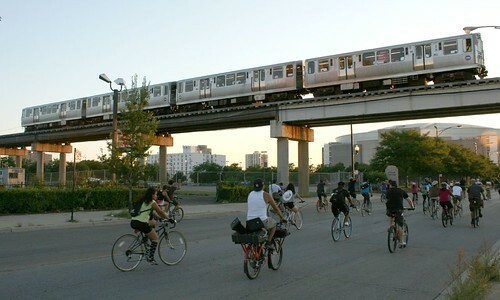 This entry was posted in biking, Life in Chicago. Bookmark the permalink. ← Aren’t you just a little bit curious? 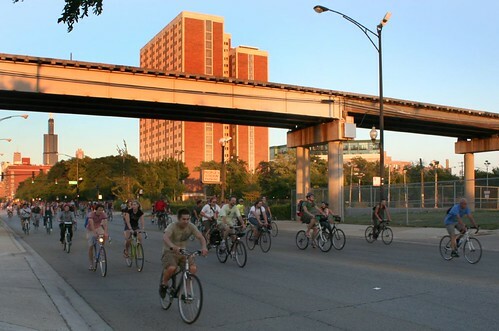 What surprised me this month was how we never "massed up," thus allowing for breaks in the mass.Also, can you imagine the bike accidents that would occur if you tried to stop the entire Mass at lights, just to let cars go? It doesn't work that way.CM is the one night of the month where riders can feel safe and just ride and enjoy the city. The cars rule the roadways every day. They can wait 15 minutes if they get caught up. 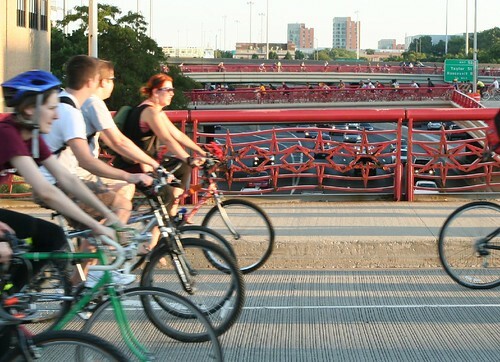 critical mass causes more pollution than it averts. it's nothing more than a nuisance to everyone – pedestrians included. i hope that these 'riders' aren't ever in the ambulance that is held up by their joyride through the city. I don't have a car, but I do take the bus to work, and have been late an several occasions as a result (I work nights in the service industry). I think it's a great idea, but one that needs to refined somehow.